There was evidence of oil leaks at the rear of the engine when I did the disassembly. And, with 97,500 miles and 40 years on this R75/5, replacing the seals is a good investment. I removed the rear sub-frame, rear drive, swing arm, transmission and the clutch before doing the work described here. You can read about how I removed the other parts in the following pages. I ordered the following from Cycle Works in Kansas. I ordered the following from Tom Cutter at Rubber Chicken Racing Garage. Do not reuse the flywheel bolts. They need to be replaced whenever you remove and install the flywheel. Should they break, it gets very expensive. The old style oil cover with Philips head screws has been updated with a new cover design that uses bolts and is a good upgrade when replacing the oil pump cover o-ring. I used Blue Permatex thread locker and Permatex Ultra-Grey RTV Silicon to stop an oil leak from one of the crankshaft flywheel bolt holes. I used a torque wrench that measures in INCH/pounds, not FOOT/pounds with a range of 20 – 200 INCH/pounds to tighten the oil pump cover bolts and a I used a regular torque wrench to tighten the flywheel bolts. After I removed the engine from the frame, I put it on my lift and secured it with straps so it was easier to work on. I moved the connecting rods so they are fully extended which placed the flywheel at top dead center (TDC) with the “OT” mark showing in the timing window. I put rags in the cylinder openings and secured the connecting rods with some wire. DANGER: It is absolutely critical to block the crankshaft from moving forward or backward when removing the flywheel. It you don’t block the crankshaft, it will move off it’s mounting perch and jam when you remount the flywheel. If that happens, you spend big bucks correcting the damage. I used a 10 mm long bolt from one of the battery terminals and inserted the threaded end into the allen head cap screw that secures the alternator to the crankshaft at the front of the engine. As shown below, the head faces outward. I mounted the timing cover and hand tightened the three allen head bolts to snug the cover on the head of the 10 mm long bolt in the alternator. I used a socket extension and Allen socket without the socket wrench handle to tighten the blots hand tight. I didn’t want to over tighten the cover bolts and damage the timing cover. This left a small gap between the timing cover and the engine indicating the cover was snugly pushing on the bolt inside the alternator bolt forcing the crankshaft into the rear thrust washer. I plugged the tachometer cable hole to keep junk from getting inside the front cover area, although I had to put more blue shop towels in the hole after I took the picture :-). There are five bolts that mount the flywheel to the rear of the crankshaft. To ensure it will mount correctly with the TDC marking on the edge of the flywheel in the timing window when the connecting rods are fully extended, I made several registration marks with a Sharpie pen identifying the bolt at the bottom of the flywheel and a mark at the perimeter. To keep the flywheel from rotating when I removed the flywheel bolts, I used the metal bar I made for securing the flywheel when I removed the clutch and connected it to the top left stud in the engine block. Then I marked where a clutch mounting hole was at the edge of the flywheel, drilled a hole in the bar and secured it to the flywheel using a clutch mounting bolt. I removed the five bolts holding the flywheel to the crankshaft. One of the crankshaft bolt holes leaked oil. I learned from Tom Cutter at Rubber Chicken Racing Garage that sometimes these holes crack through to the crankshaft oil passage behind them. Later, I’ll show how he suggested I fix the oil leak. This turned out to be a bit difficult. I could not remove it by hand and I did not have the flywheel puller tool available from Cycle Works. I strongly advise you to use a flywheel puller, such as the one I purchased later from Cycle Works . I didn’t think I needed it. I was wrong. After 20 mins of effort I got the flywheel off using a technique THAT IS NOT A GOOD IDEA!!! I decided to try heating the flywheel with a torch and using the clutch bolts to pull it off the crankshaft. The flywheel would wiggle a little bit off the crankshaft nose, but not very much before the flywheel cooled down. The transmission has to mount flush against the engine all the way around, so if had I cracked the lip of the housing or flattened it, I would have had a real problem. Also, heating the flywheel when it is mounted on the nose of the crankshaft won’t get much expansion as both are steel and the heat difference won’t be very much. After I removed the flywheel, I bought the Cycle Works tool and ended up using it to remove the flywheel several times for reasons that will become clear later on. Here is the right way to remove the flywheel in about 3 minutes with no need to head the flywheel. The Cycle Works flywheel puller can also be used to hold the flywheel when removing the five flywheel bolts. I had made my own tool that doubled to block the flywheel when tightening or removing the clutch bolts, but this is a handy tool. The back end of the engine housing where the transmission and clutch go was a mess. It looks like oil has been leaking from the oil pump cover mixing with the dust from the clutch to create a lot of grunge. I put a lot of newspaper on the shop mat and then I cleaned up all the grunge with a couple cans of foamy engine cleaner, toothbrushes and nylon bristle brushes until it was shiny again. I used a spray bottle of water to wash off the engine cleaner and oil and then cleaned it again with some brake cleaner to remove the last traces of grunge. I don’t want the crud to get on the new rear main seal or o-ring. The newspaper soaked up a lot of the dirty water and I mopped up the small amount remaining on the shop mat with blue paper shop towels. I inspected the flywheel and there are some burrs on the teeth on the perimeter of the flywheel that the starter motor engages the flywheel. By the way, the 45 degree angle on the teeth is not caused by wear but is machined to allow the flywheel teeth to engage with the starter motor gear. That gear runs at 90 degrees to the flywheel, so there has to be a 45 degree angle cut into both the flywheel and the starter motor gear teeth. In checking the wisdom on the BMW Airhead forum on micapeak, the consensus is the teeth are not bad, but should be filed with a flat file to remove the burrs on the edge of the teeth. 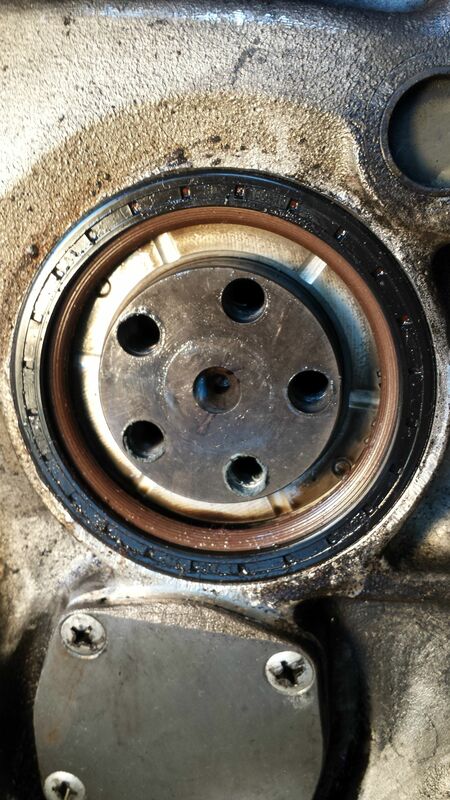 The outside of the flywheel hub rubs against the rear main seal and wears over time, as is evident in the picture below. The older style rear main seal has a narrow contact patch on the hub which cuts a narrow groove over time. This wear can lead to oil leaking past the old style rear main seal and required old style replacement seals to be located so they contacted an unworn part of the hub. The new seal that I am using has a larger contact patch and I don’t need worry about installing it so it avoids the wear ring in the hub. The consensus is this is not a deep groove and the flywheel is still serviceable. The rest of the hub doesn’t show any damage, although there is discoloration caused over time. Tom Cutter suggested that I polish the hub with metal polish until the discoloration was removed. Below is the hub after cleaning it up. Finally, I put some Testor’s model paint on the timing marks and letters on the rim of the flywheel to make it easy to see them: yellow for “OT”, white for “S” and red for “F”. The flywheel is ready for installation. The oil pump cover has been redesigned and uses 10 mm bolts instead of Philips head screws. You can not use the Philips head screws with the new cover, but why would you want to? It’s much easier to torque bolts and remove them. Removing the old screws requires an impact driver to get them loose, or you will likely strip out the heads with a screwdriver. A couple of raps with the mallet and they loosened up so I could remove the pump cover. When the cover is removed, the pump gears are visible: and inner four-lobe rotor and an outer five-lobe hypocycloid chamber. Each has a punch mark and they should be facing you when the pump parts are installed correctly as shown below. I removed them to check for any damage. The four-lobe rotor is secured on the oil pump shaft with a woodruff key, and in my case, the key was on the bottom of the shaft which is visible in the photo below. I used cam lobe grease to hold the woodruff key in the slot on the oil pump shaft against gravity when I put the four-lobe gear back on the shaft. I put some grease on the wearing surfaces of the pump rotor and the hypocycloid gear. This will provide some lubrication when the engine starts until the oil circulates in the pump, and it may be while before the engine starts again so just squirting oil on the gears may not provide sufficient lubrication during the first engine start. Here is the new (left) and old (right) oil pump covers. Here are the new (red) and old (black) pump cover o-rings. The old o-ring is flattened and hardened and that lets the oil leak past the cover. I put the new o-ring into the groove on the backside of the pump cover using some thick grease to help keep it in the groove so it wouldn’t shift when I put the new cover on and get pinched. I put Blue Permatex thread locker on the new 10 mm bolts. The bolts are tightened to 72 – 76 INCH/pounds, NOT FOOT POUNDS. I didn’t have a torque wrench that measures in INCH/pounds, so this was an opportunity to add one to the tool box. The oil pump cover only goes one way as the top holes are closer together than the bottom ones. You can see the beveled edge of the cover goes at the top. I finger tightened the Permatexed bolts into the cover. I then torqued them to 72 INCH/pounds in increments in a cross-wise pattern. All done and the bike has a new oil pump cover and o-ring. Tom Cutter suggested using RTV to seal the leak at the bottom of the crankshaft bolt hole. I used Permatex Ultra Grey Ridgid High Torque RTV Silicone. I wanted to be sure I didn’t get any of it on the threads, and I wasn’t sure how deep the tapered nozzle would go into the hole. So I made some measurements. The flywheel bolt has a shoulder under the head that fits the hole in the flywheel and rests on the face of the crankshaft, so that is how far the bolt will go into the crankshaft. I put the nozzle of the RTV tube into the hole and marked it to see how deep it would go. Then I compared that to the bolt to see if the nozzle was going past the threads. And, it does go deeper than the threads. So, if I insert the nozzle all the way into the hole and give a squeeze, the silicone will fill the void below the threads. I put a little into the hole and then ran the flywheel bolt all the way in to check the depth of the RTV and then added a little more and checked again until the bottom of the bolt just touched the RTV silicone to ensure I didn’t over fill the void and get silicon on the threads. Here is the crankshaft hole with the Ultra Gray RTV silicone at the bottom. I let this set over night before continuing. I bought the Rear Main Seal Puller tool from Cycle Works. I used the following to pull the rear main seal: the disk, the sheet metal screws and two of the flywheel bolts. I attached the disk to the crankshaft with the flywheel bolts and then screwed the sheet metal screws into the edge of the rear main seal. When the screws bottomed out I stopped since that indicated they had penetrated the outer ring of the seal. The screws will not be flush with the black disk, but will be proud of it as shown below. Then I threaded the large bolt into the center hole until it pressed on the end of the crankshaft. I had to use a crescent wrench to turn the bolt to pull out the old seal. After some initial resistance, it came out easily. I backed out the sheet metal screws to remove the old seal from the black puller disk. As shown here, there is a metal thrust washer, aka. stop disk, behind the rear main seal that slips over two pins in the engine case. I didn’t intend to replace the thrust washer. Make sure it’s on the pins with the white radial stripes facing you before you install the new seal. The old seal design has a narrow contact area and a metal spring in the back. But the new seal does not and has a larger contact strip. It is made of PTFE, which is a Teflon material. BMW published a service bulletin in 1988 on how to prepare the new seal for installation. Advice I received on the Micapeak BMW Airhead forum suggested heating the seal in 150 F oil to soften it prior to forming it on the flywheel hub. Heating the seal to 150 F to soften it is not required. I no longer bother with this step. I preshape it on the nose of the flywheel before installing it. I let the seal sit for about 10 minutes and then pushed it onto the hub of the flywheel to form the seal around the hub, and then removed it so I can install the preformed seal in the engine. When doing this, the back side of the seal faces you and the front side is against the face of the flywheel. The earlier pictures show the back and front sides of the seal. These are the parts I used to install the seal back in the engine: the puller disk, the flat washers and the flywheel bolts. I inspected the aluminum housing that the seal fits into to be sure there were no sharp edges that could damage the seal. If there were any, 600 wet sandpaper can be used to dress the edges. I sprayed the engine housing with brake cleaner to be sure it and the crankshaft are clean and there is no grit or contamination on the surfaces. Then I put the stop ring back in place on the pins in the engine housing. You can see the top left pin at the 10:00 position and bottom right pin at the 4:00 position just behind the stop ring in the picture below. DANGER: It is very important to be sure the rear thrust washer STAYS on the pins. Even when the rear main seal is installed, it is possible for the thrust washer to come off the pins. I used a heat gun to heat the aluminum housing to about 150 F to help ease the seal into the hole. I pressed the new seal that had been formed on the hub of the flywheel by hand into the engine casing trying to keep it aligned as much as possible. Then, I used the flywheel bolts with washers to mount the black disk on top of the seal and finger tightened all the bolts checking that seal was aligned in the hole. Where it was a bit proud, I tightened the corresponding flywheel bolt a bit more until it was even. Using a cross-wise pattern I tightened each bolt a half-turn until the seal bottomed out on the land in the engine case. This set the seal all the way into the hole. This is correct for the new seals and you don’t have to worry about positioning the seal so it doesn’t line up with the wear ring in the flywheel hub. The new seal design has a large contact area and will seal over wear rings in the flywheel hub when it is pulled all the way into the hole. DANGER: Do Not Reuse the old flywheel bolts. Install it ONLY with new bolts. The flywheel bolts are designed to stretch when torqued. They should not be reused. After the difficulty I had removing the flywheel, I purchased the Cycle Works flywheel puller to help with installation. I heated the flywheel around the bolt holes with a propane torch. It took about 5-10 minutes to get it to 200-220 degrees as measured with my infrared remote thermometer. Using the spit method, this would be “sizzle hot”. I attached the flywheel puller using the long bolts in the puller kit and used welding gloves to handle the flywheel so I wouldn’t burn myself. 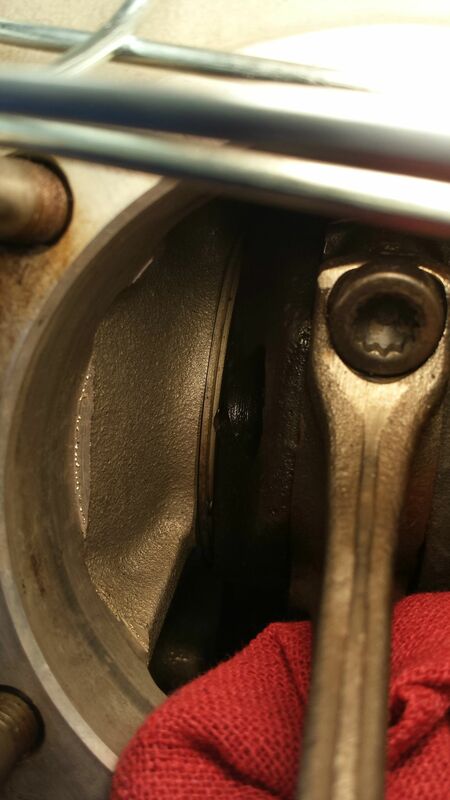 Then, I checked that the crankshaft was still positioned so the pistons are at top-dead-center: I made sure the connecting rods were fully extended, and confirmed the timing mark was at OT in the timing window. Then when I had pushed the flywheel onto the crankshaft a bit, I checked the registration marks at the perimeter were in the same position as when I removed the flywheel. The OT mark doesn’t have to be precisely in the window since misalignment would be one or more bolt holes off and each of those is 72 degrees so it would be very obvious the flywheel was not aligned correctly on the crankshaft. DANGER: Before you put the flywheel on the crankshaft, check to see that the rear thrust washer is still on the pins. Reach inside and try to rotate the thrust washer with two fingers. It should not rotate. If it does, it is off the pins. You can get it back on the pins by pulling it forward and turning it so the holes in the thrust washer align with the pins and the thrust washer is pushed back against the boss in the engine. The first time I did this job, the thrust washer came off one of the pins. I discovered this AFTER torquing the flywheel and removing the bolt in the alternator that blocked the crankshaft from moving. I put an Allan wrench in the alternator bolt to turn the engine and it would not move. THIS IS BAD. I removed the flywheel and looked at the rear thrust washer. It was on the top left pin, but the bottom right pin was partially obscured by metal. I removed the rear main seal and inspected the trust washer. The holes were not round and there was shiny metal where the thrust washer had contacted the flywheel on the front side. I think I jarred the thrust washer off the lower pin when I used a rubber mallet to drive the heated flywheel onto the crankshaft. The vibration caused the thrust washer to move. I ordered a new rear thrust washer of the same thickness as the damaged one, new flywheel bolts (they are not to be reused as they stretch when torqued down) and a new rear main seal. Thrust washers come in different thickness to adjust the crankshaft end play. Using the partial part number on the back of my original one and also a caliper, I confirmed it was a “Blue” size, so I ordered the same size to replace it. Here is the new thrust washer with the blue dot. It was very close to the thickness of the original one so the old thrust washer hadn’t worn much in 97,500 miles. And here is a comparison of the new thrust washer and the damaged one. This time, before I mounted the crankshaft, I checked to be sure that the thrust washer was still centered firmly on the pins. I used the flywheel removal bar to press the heated flywheel onto the crankshaft. When it had slid firmly onto the crankshaft, I used the flywheel bolts to draw it onto the crankshaft tightening them a half turn at a time in a cross pattern. I rotated the flywheel back and forth when it got close to being fully seated onto the crankshaft to be sure I could not feel any increased resistance to rotation. If I felt any, then the trust washer was off the pins again, but I would know it and can fix this before I torqued the flywheel bolts and break things. When the bolts seated I backed them off 1/16 turn so the shoulder of the bolt is still in the flywheel hole and let the flywheel cool down to room temperature. Then I wiggle the flywheel clockwise and counterclockwise to be sure the flywheel is centered on the bolts and finger tighten the bolts. Once again, I made sure the flywheel and crankshaft rotate without any increased resistance. Then I mounted the flywheel removal tool to the right side stud in the engine and bolted it to the flywheel using the two long bolts in the puller kit, although a single bolt will work. The torque setting for the flywheel bolts is 45 – 50 Foot/Pounds. I set the torque wrench to 47 Foot/Pounds. I tightened the bolts in a cross-wise pattern in increments until the torque wrench slips. Here is the installed flywheel. 2017-03-17 Added note about not needing to heat seal to 150 F.
Cool beans. I’m glad this was helpful. I am at this phase of a 1985 R80 rebuild. New rear main seal is installed and thrust washer is on the pins. I also replaced the stator on the front end of the crank. Upon reassembly, I noticed the brushes no longer align with previous wear pattern on the slip rings. I feared I had allowed the crank to slip forward during removal of the flywheel (clutch carrier for me.) I have tightened the carrier bolts, not torqued them yet, and can force a very slight movement in the crank, fore and aft, by shoving and pulling on the carrier. I did measure the thickness of the stator and determined there to be a 2mm difference in thickness between the new one and the original. This equals the off-set in my brushes to slip ring alignment. Main question is should I be able to force play in the crank after flywheel (clutch carrier) is installed? Seems like I might have a heck of an engine noise once reassembled and running. Thank you very much for your assistance. I’m not expert enough to advise what has happened, but your observations suggest the crank shaft has moved, the stator housing has moved or the rotor has moved. That said, if the front end of the crank was blocked to prevent forward movement when you removed the flywheel to replace the rear main seal and you kept it blocked until you installed the flywheel and torqued the flywheel bolts, then I don’t see how the front thrust washer would have come off the pins. When I had the problem with my rear thrust washer coming off the pins, the crankshaft became very hard to turn since the washer gets jammed between the flywheel and the engine housing. I suspect something similar happens if the front thrust washer came loose. So, if it is very easy to turn the crank, then the thrust washers are fine. The difference in stator thickness seems more likely the reason for the brushes to get moved on the slip rings. Did you remove the rotor? If so, it is possible when installing the rotor on the front nose of the crankshaft that you may not have gotten it all the way onto the taper which would change the brush position on the slip rings, but I don’t think you said you removed it to replace the front crankshaft seal. There is some crankshaft end play and so there maybe some detectable movement of the crank if you really push hard on it. Actual measurements of end play require removing the housing behind the alternator rotor to expose the cam chain, so this isn’t a quick procedure. You may want to join the airhead forum on micapeak. There are some very skilled professional mechanics who can provide much more informed advice and diagnostic procedures. They were very helfpul when I found it hard to turn the crank after installing the rear main seal. Thanks Brook. I did remove the rotor and did replace the crank seal. I’m going to reinstall the old stator to confirm my suspicion the new aftermarket stator is thinner. Thank you very much for taking time to assist me. Bob (Snowbum) and the other heads have weighed in in the issue. I am fairly confident the crank is still happily situated. The play I can detect with forced shoves is probabley neseccary for oil flow when running. brook, why heating the flywheel? i don’t understand the rationale for that. The flywheel is a very tight fit on the crankshaft nose. To correctly position it so the holes in the flywheel exactly align with the holes in the crankshaft is about impossible unless the flywheel hub is heated to expand it. Then it can be rotated easily to position the holes so the flywheel bolts can be finger tightened to ensure they are properly aligned. The bolts should not be forced against the edge of the hole in the flywheel as that creates a stress concentration in the bolts and can lead to them breaking. When I removed the flywheel the first time, I didn’t have a flywheel puller. Heating near the bolts helped expand the flywheel hub, but there is little gain since the heat applied to the flywheel transfers to the crankshaft nose quickly so the expansion of the flywheel hub is just about offset by expansion of the crankshaft nose. Nonetheless, I could get it off without a flywheel puller using repeated applications of heat and prying around the edges carefully. This is NOT optimal, but it can work in a pinch. After my initial “puller-less” attempt to remove the flywheel, I bought a flywheel puller as noted in the write-up and used it when I found I had damaged the outer rear thrust washer. It took 2 minutes to remove the flywheel instead of 30 and there was far less opportunity to damage the edge of the bell housing. For that reason, I recommend using a puller. thanks brook. i have the pullers from cycleworks (rear seal and flywheel both) but i didn’t need the flywheel puller other than to stabilise while removing bolts. i was able fortunately to walk the flywheel off. but i will do the heating of the flywheel as in your article, thanks for the explanation. Cool beans. Mine was quite tight. Best of luck on the project. I went through this yesterday with this article in mind. I made sure the thrust washer was pinned/seated before torquing the flywheel on. I used the bolts to pull the wheel onto the crank. I had the timing cover bolted on, so i thought that the ball bearing on the crank nose that seats into the timing cover would keep the crank from walking – am I wrong? Can you explain how/why the crank can move? After torquing everything up – my crank is very stiff to rotate. Not thrilled. You don’t explicitly mention it, but I assume you are working on a /5 model bike. Hmmm … from what you are telling me and your description of the result, “…stiff to rotate”, I suspect one of the 2 crankshaft thrust washers has come off it’s pins. The one that is exposed when you pull the flywheel is the rear thrust washer. The front thrust washer is just like it and on the other side behind the engine case. The crankshaft can move front-to-back on its bearings when the flywheel is removed. If it moves forward, the front thrust washer can come off its pins inside the engine. To prevent this, the front of the crankshaft has to be held all the way back to keep the front thrust washer on its pins. Using a block of wood or a bolt in the alternator Allan bolt and then fastening the front cover only until it presses firmly on the block or bolt (not too tight or you can damage the front cover) keeps the crankshaft from moving forward when the flywheel is removed. I show how I blocked the front of the crankshaft in my write-up. When I tightened the bolts on the front cover, I only made them “snug” and there is a picture of the small gap between the cover and the engine case that confirmed the bolt head contacted the front cover. That way, I was positive the front of the crank was being pushed to the rear. IF (and I don’t know if this is the case for you) you didn’t block the crankshaft from moving forward, AND, when you get back inside to the rear thrust washer. AND it is on the pins, THEN the front thrust washer is off it’s pins. 🙁 Bob Fleischer has some ideas you can try to get the front thrust washer back on the pins if it is just partly off them. IF that doesn’t work, as far as I know, removal of the crankshaft is necessary to replace the front thrust washer. Further, it is important to inspect the crankshaft and the front thrust washer pins for damage and proceed accordingly. I have not done this procedure so I don’t have any experience I can share. This situation worried me, (and I needed to change the oil pump gasket anyway) so i just pulled the flywheel and threw away the bolts. Rear thrust washer is on it’s pins…right where I left it. Is there a way to tell if the thrust washer was in the right place? maybe tap the crank forward until you can spin the front thrust washer? As expected, the engine rotates freely now with the flywheel off. I can’t verify the position of the front thrust washer vs. where the pins are from your picture due to my lack of experience. I’m sorry I can’t provide you any practical advice. It maybe that the front thrust washer came off the pins and then when you tightened up the flywheel, the pins punctured the back of the thrust washer. However, the pins won’t push all the way through the washer, so theyt push it forward on the crank nose enough to bind up on the face of the crankshaft boss when the flywheel is tightened. But, I’m out of my depth at this point. I suggest you join the micapeak airhead forum, if you aren’t a member already, and post a note about your situation. Tom Cutter and Bob Fleischer are very active on the site and are two of the most knowledgeable airhead mechanics around. I’ve learned a great deal from them and their posts. Stay cool and connect with the experts on the airhead forum. They are always willing to help folks with any problems. Thanks for the advice so far! I’ll check out the forum – sounds like a perfect place to join up. FWIW – i am able to jiggle the front thrust washer on its pins.. and the rear too. (nothing is seized up). Things are looking up! Interesting. By chance did you replace the rear thrust washer as part of your work? These come in difference thickness IIRC and if a thicker one was used, that would reduce crank end clearance and could result in binding. I’ll look forward to your first post in the airheads forum so we can figure out what is going on. No, I utilized the existing thrust washer. That would make sense though if it was somehow thicker than it should’ve been. I’m wondering if my rear main seal just needs to be pressed in another 1/16″ to be completely flush with case. This could be the cause of my drag… seeing how both thrust washers seem to be in place and not pinched. Just waiting for approval to join micapeak. Well, it is supposed to be recessed a bit into the hole. See this picture of my new seal. Also, the lip of the seal needs to be formed around the crank nose prior to installation. Brook – I think we may have found the issue. My seal is sticking out just a tad from flush. Will countersink it some. (or buy the right tool). My flywheel is loose. I think the bolts backed off. Can I tighten them without taking engine out of frame ? Thanks for stopping by and reading this write-up. I’m curious about how you determined that the flywheel is loose. Do you mean you can rotate the flywheel, but not the crankshaft? Or ?? I ask because you don’t mention how you determined this. To really determine if it’s loose, you would have removed the transmission and the clutch, but you don’t mention if you have or not. If the flywheel is loose (you can wiggle it or rotate it on the crankshaft without turning the crankshaft), then are one or more of the bolts loose? Is one or more sheared off? That can happen if they actually “backed out”, in which case you have to remove the remainder of the bolt from the crankshaft nose. The flywheel bolts are designed to stretch, so I would typically replace all of them anytime I remove the flywheel. If you find one or more have backed off, but not sheared off, I would remove the flywheel to inspect the holes in the crankshaft for stripped threads or other damage. The above is written from the perspective of “being safe rather than sorry” to ensure you don’t have a real problem that could result in major engine damage. BTW, you may want to join the airhead forum on micapeak where you will find a number of people with extensive experience with airhead motors and have good advice about how to handle problems such as sheared flywheel bolts, etc. I’ve learned a great deal from this forum and it has been the resource I used most extensively as I did this rebuild. Great write up and you saved me from pulling the crank wondering why the flywheel wouldn’t move…the thrust washer was off the pins. I’m sorry to hear that the thrust washer came off the pins. I assume, as in my case, it is the rear washer and you could get it back on. When I removed the bolts from the flywheel, oil came out of the bolt hole in the crankshaft face. If the flywheel is not attached to the crankshaft AND the front of the crankshaft is not blocked so it pushes the crankshaft to the rear of the engine case THEN the front thrust washer (the one inside the engine case at the rear of the crankshaft) can come off it’s two pins. IF that happens, then the crankshaft has to be removed and the thrust washer inspected for damage, if damaged replaced, but in any case, put back on the pins and the crankshaft reinstalled. In this instance, the crankshaft end play has to be measured to ensure it is correct and if not, the rear thrust washer (next to the flywheel) changed to the proper thickness to achieve the correct end play. If the front thrust washer is off it’s pins and you tighten up the flywheel bolts, you will damage the crankshaft and/or the engine case. To me the most sensible approach is to have an expert guy at my elbow when I prepare my engine. I’ll have him come out and we can do the measurements. He goes to California every winter, so, in the spring it will be time to assemble and I plan to have everything ready. In the meantime I will take a close look at what I’ve got ;with him with me, and write down what I have to do in steps..
Great write-up, which I will be following when I do this work myself soon. I’m trying to save money on once-in-a-lifetime use tools and wondering if I might be able to make a homemade version of the flywheel puller, using the center bolt that comes with the seal puller/installer (assuming I do buy that tool). Looks like they both have a special center bolt that has a ball bearing in the end. Other than that, would a piece of 3/4″ plywood with some holes drilled in it work for the flywheel puller? Might save me $31, so just wondering. You don’t mention what year bike you have, but I’ll assume it’s a /5. My /5 flywheel was on very tightly while the flywheel on the 1977 R100RS I’m currently working on came off just by wiggling it. The difference is the change in the flywheel design. The R100RS uses an O-ring to seal the flywheel to crankshaft while the /5 is direct metal-to-metal contact. When I used the Cycle Works tool, it took a fair amount of force on the bolt to get the /5 flywheel to move off the crankshaft. You certainly can create a tool to pull the flywheel. You may find plywood will hold up, or it may not, but you won’t damage anything by trying. The center bolt is the same for the seal puller and flywheel puller AFAIK. And, you could join the Airheads Beemer Club where you likely will find someone in your area who would be willing to loan you their tool. I make my tools available to Airheads in my area. Notice you soaked the rear main seal in oil. I got one from Elring. A PTFE seal. Looking exactly like the same as yours. All instructions I can find says that installation should be done dry, with all mating surfaces clean. Both from supplier and various forums states this. You don’t need to soak the seal in “hot” oil prior to installation. It should be preformed on the flywheel nose prior to installation. The oil soaking advice I got turns out to be an “old wifes tail”. 🙂 That said, it does no harm, just a waste of time. Hi Brook, it’s Dave from England. I’m having trouble with oil leaking fron the crankshaft at the flywheel end. I renewed the oil seal with the new later PTFE type but by chance I didn’t read your full write up regarding the spacers and I hadn’t noticed then as I dismantled it some time before. Anyway the clutch was solid so I knew something was amiss. Replaced the cover with the new type which doesn’t require spacers. However, my son, who is a mechanic noticed oil in the centre of the flywheel so we replaced the oil seal again withe the old style seal. Assembled it all and ran the engine but alas oil dripped from the bottom of the gearbox near the fly wheel. So it’s all out again but we can find nothing other than oil in the centre of the flywheel but nothing untoward round the main oil seal. What puzzles us is that there appears to be nothing to stop the oil leaking through the centre as it’s just metal to metal. It is mentioned that in later models there is an O ring in the flywheel but mine is a 1972 75/5 with no groove. Do you have any suggestions regarding oil leakage? In addition all the advice over here regarding PTFE oil seals is that in no account should oil or grease be used just set them on the flywheel for and hour or so then fit them and don’t start the engine for at least 4 hours. A few thoughts to share came to mind. 1. I have had the flywheel bolt holes leak oil on two engines. That will put a puddle inside. I show how to fix this on the R75/5. 2. It the old flywheel has a groove worn in it from the original seal, and you use the original seal again and don’t deliberately change the depth of the seal when you install it, it will line up with the groove and you get a leak. 3. The new PTFE seal has a longer lip and should overcome a leak around the groove. That said, if the groove is pretty deep in the flywheel, it may not be able to seal properly without adjusting the position of the PTFE seal. 4. Are you sure it’s oil and not transmission lube? It’s possible for the input shaft seal on the transmission to leak which would coat the center of the crankshaft. The sulfur smell of the transmission gear lube is an easy way to tell which fluid is leading. That’s all the thoughts I have right now. Best of luck sorting this out. Hi, thanks for your prompt reply. When engine was running the drip from the bottom of the engine casing below the flywheel was quite steady and definitely engine oil. We are going to push the seal in a little further attach the flywheel and run the motor to see if the leak is still there. I just have finished the restauration work on my 1982 R80G/S, as I found your excellent blog! Still a great read that might come to help for some next projects. Perfect, thanks for the detailed description! I am in the middle of it, pulling the fly wheel later and then replacing the main engine seal and oil pump o-ring, but I also have a leaking transmission input shaft seal….I remembered that you had prepared this write-up and since it’s the first time for me doing this, I found it very helpful to read all over it again. Great work! I’m pleased this write-up has helped you on your project.